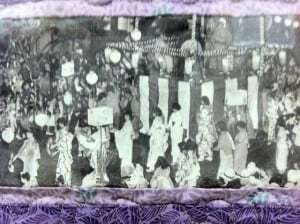 For over a century, Sakura Gakuen has provided various services including instruction on language and cultural traditions and customs. The language school was founded in 1903 as a school for the children of Japanese immigrants. The school initially was called Nihon Sho Gakko (Japanese Grammar School). To serve the growing Japanese population in the western United States as immigration grew in the 1890’s, the Nishi-Hongwanji Temple of Kyoto, headquarters of the Jodo Shinshu path of Buddhism founded by Shinran Shonin, began establishing temples on this side of the Pacific. 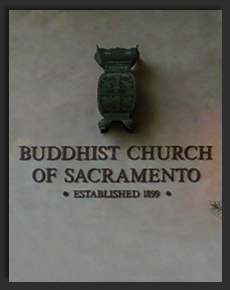 The Buddhist Church of Sacramento, the second oldest Jodo Shinshu Buddist Temple in the mainland United States, was established in 1899. In conjunction with the development of temples in the United States, schools were begun as a way to pass on language and culture to successive generations. Today the school serves all that are interested in learning the language and culture of Japan. PHOTO: Readers at Tanforan Library, courtesy of Bancroft Library. In 1903, to accommodate the agricultural families’ needs to be away working in the fields, the new Japanese school was a boarding school. The curriculum was based on that of Japanese schools, including reading, writing, spelling, composition, speech, English translation, Japanese geography and history. In 1923 an arson fire at the school dormitory tragically took the lives of 10 students. The dormitory was never rebuilt, but the school continued to grow and annexes were built under the school renamed Sacramento Gakuen. By 1941, it was the largest Japanese school in Northern California with over 350 students enrolled. On December 7th of that year, the school voluntarily closed its doors. The February 19th, 1942 Executive Order 9066 forced West Coast Americans of Japanese ancestry into internment camps and the Buddhist Church of Sacramento buildings were occupied by the United States Army until September 1946. 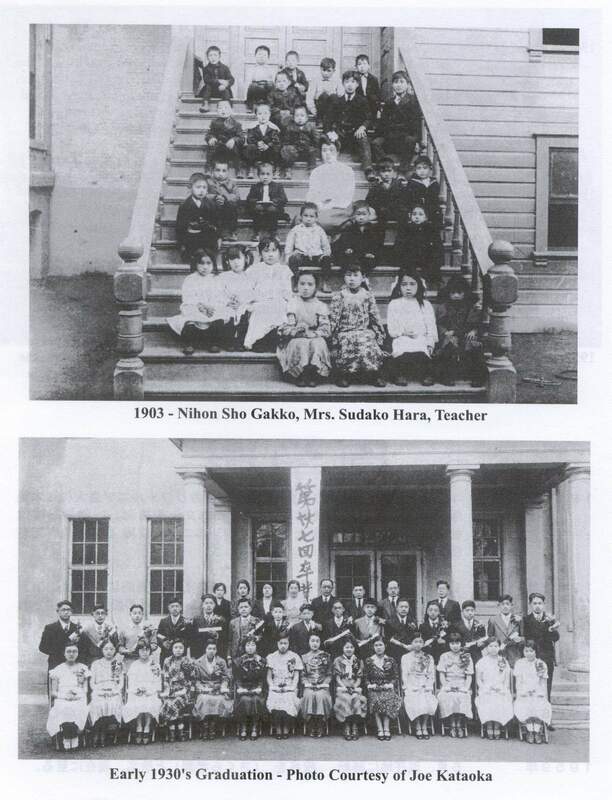 Thanks to the efforts of Reverend and Mrs. Sasaki that the school, renamed Sakura Gakuen, was reopened in 1947. The school blossomed over the next few decades and Saturday morning and adult classes were offered in addition to the weekday classes. The curriculum included not only Japanese language instruction, but calligraphy, Japanese etiquette, origami, sewing traditional attire and use of the abacus as well. 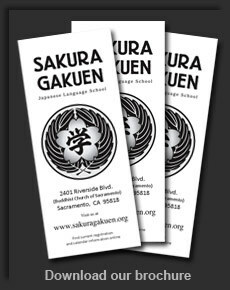 In 1971, Sakura Gakuen was certified by the Sacramento City Unified School District to issue foreign language credits to senior high school students. Picture from Sacramento Buddhist Church 100 year photo quilt. Image by Amabelle Ocampo. In the 1980’s, as more public schools began to offer Japanese language courses, the number of students studying at Sakura Gakuen declined. At that point the assimilation of Japanese Americans had resulted in many students coming from homes where Japanese was not spoken at home. As a result, Sakura Gakuen shifted to become a language school teaching Japanese as a second language. In 1986 the school was reorganized to be a Saturday school for children with class levels based primarily on ability, not age, and added adult focused classes on Monday evenings. Today the outstanding language and cultural program benefits from the efforts of dedicated staff and volunteer parents. Sakura Gakuen alumni have gone on to major in languages, work abroad and even bring their children and grandchildren to the school. The children’s school student body consists of members of many backgrounds reflecting the rich diversity of the Sacramento region. Students come from English speaking, Japanese speaking, bilingual and multilingual homes. Parents bring their children from places as far away as Placerville, Stockton, Yuba City, Vallejo and Rocklin to study.The popularity of anime and other endearing facets of Japanese culture, in addition to the growing realization of the shrinking world, have contributed to a resurgence in enthusiasm and enrollment at the school. Sakura Gakuen continues the tradition of a safe and welcoming place for children to expand their horizons by learning about Japanese language and culture. Through the communal efforts of dedicated parents and alumni this historic resource will endure and adapt to serve the needs of the Sacramento region. Come contribute to the legacy of Sakura Gakuen.